We have carried these since we opened the shop in 2008 and they continue to be a hit! Kids seem to gravitate to them. The shape and colors are inviting but there's much more. They are great tools to develop a grip necessary for good handwriting with pencils and pens. They are made with soy wax- as opposed to petroleum wax used for common crayons- and use natural pigments for their coloring. They are buttery in use and are also long lasting. (See our sample pack at the shop. It's the original one and they look like they've hardly been used!) They don't break like common crayons and don't have paper that gets in the way. And they also have multiple surfaces for sharp lines and shading. These water-soluble botanical pigments become paint just by adding water. Made from fruits, vegetables, flowers and spices with natural, food-grade ingredients for nature-inspired arts and crafts. They are truly non-toxic. The packaging is attractive and also biodegradable. Made in the USA. Sustainable, natural, vegan, gluten-free! We're carrying the 6 pack of colors- in seed-type paper packets- encased in a corrugated container and the DIY Paint Kit that includes the 6 packs, 6 compostable jars with lids and 2 bamboo brushes all contained in a beautiful rice paper pouch. Looks like a linoleum print! No sharp tools needed! Produce dozens of beautiful sharp prints quickly, easily and safely. Simply use a ballpoint pen, pencil, or stick to draw on these "soft-as-butter" specially formulated white foam sheets. Compresses easily--objects can be pressed into the sensitive Scratch-Foam surface to create shapes, forms and textures. Ink the Scratch-Foam "plate" with waterbased ink, roll with a brayer and print on your favorite paper. Then wash off the ink and change colors! Easy to clean and store. Instructions included. We carry 6"x9"(30sheets), 9"x12"(12sheets) and 12"x18"(12sheets) and packs of Subi Block Printing Paper in 9"x12" and 12"x18" in multi-color packs and 9"x12" packs of white. Water-soluble oil pastels offer a variety of unique and flexible features. Use for wet or dry work. In their solid state, these bright, vivid colors dry blend into true secondary colors with the traditional creamy consistency of oil pastels. Dip in water, or use a wet brush to blend colors and create exciting watercolor effects. Nontoxic. Box of 24 colors. 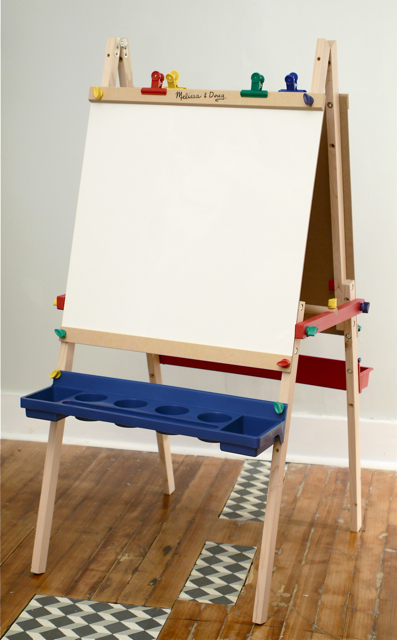 A sturdy multi-purpose wood easel. Double sided with supply trays on both sides, dry erase board on one side, chalkboard on the other. Folds for easy moving. Holds a roll of easel paper. Comes with colorful clips.